More than a few of you will have heard the familiar refrain of Auld Lang Syne last weekend. 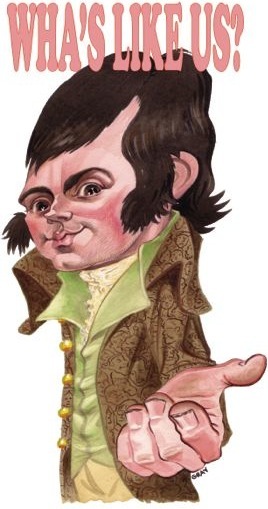 Rabbie Burns looms large in the Scottish mindset at the beginning and end of every January, as we remember our national bard around his birthday on the 25th. We argue that power lies in caricature, the act of observing and exaggerating – or distilling – the physical aspects of another’s face and getting it down in a drawing. The Wha’s Like Us? workshops are for P6/7 pupils and will run at the Harbour Arts Centre, Irvine; the centre has invited classes looking at the topic of Burns to participate. We’ll write about further projects in communities around Scotland throughout 2012.